Whether you are feeling a sharp pain directly under the heel or a constant ache of the entire foot, if you’re a runner, chances are you are experiencing plantar fasciitis. So, what exactly is plantar fasciitis? First, you must understand that there’s a strong band of tissue in the middle of your foot that supports your arch. This band I’m referring to is the plantar fascia. From the constant force of striking the ground, overtime this band over stretches. Sometimes there’s no issue, but sometimes this band becomes inflamed. And during this inflammation process is when you experience heel pain when you run. Now, the pain can sometimes go away and it’s usually the most painful first thing in the morning or at the beginning of a run. But once the blood starts flowing and your body warms up, the pain can go away. That’s until the next morning or the start of your next run. When this occurs the pain comes back and can even become worse depending on how you promote recovery on your rest days. But for us runners, the pain of not running can sometimes outweigh the pain of plantar fasciitis. I know it does for me. So…. we run anyway. And as the pain gets worse we rush to find the quickest route to recovery, and most of the time, it’s through our running shoes. So, here is when it becomes critical to choose the RIGHT running shoe for YOU. Before learning the benefits of wearing the right running shoe, you must first know its only part of the equation. The cause and relief of plantar fasciitis are determined by TWO main circumstances: running shoes and form. Poor form has a direct link to plantar fasciitis. And if your form is the culprit then the further you run, or the more times you run per week, the worse your injury will get. For example, heel striking can wreak havoc on your feet thus causing plantar fasciitis. But by practicing a mid-foot strike, you will have a significant chance of eliminating the injury. Yes, learning proper form is part of the equation, but it’s the smaller part. In my opinion, what has the most impact on reducing plantar fasciitis is your running shoe. Meaning—the RIGHT running shoe for YOU. And fortunate for you, that’s what this guide is all about. It’s to help you choose the right running shoe for your stride. Know this: the right shoe can prevent plantar fasciitis, but the wrong shoe can create it! So buying a shoe designed to prevent plantar fasciitis benefits you in two ways. First, it helps compensate for poor form thus eliminating the pain. Or second, if you’re running with the wrong shoe, switching to the right shoe has the potential to eliminate the cause, and you will never have to worry about the injury again. It’s amazing how a simple change of shoe creates the chance of completely eliminating plantar fasciitis for good. No, it’s not definite, but regardless, wearing the right running shoe will only help. 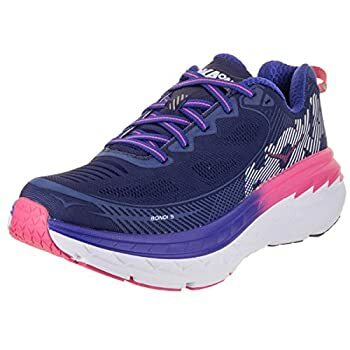 So, now that you have realized that buying the right running shoe is most likely a good idea, let’s discuss some of the KEY features to look for when choosing a shoe. When choosing a shoe for plantar fasciitis, I recommend deciding based on five key components. The components are as followed: stability, support, cushion, manufacturer, and reviews. Please read on as I briefly explain each. First and foremost, it’s essential to use a stable shoe designed for your particular foot strike. To do so, you must know there are three main categories of running shoes: overpronation, neutral, and supination. Generally speaking, overpronation is when you have little to no arch, and your foot rolls inward when you stride. Supination is when you have medium to high arches, and your foot rolls outward when you stride. And a neutral foot strike is somewhere between the two. Both overpronation and supination can cause misalignment issues that create overuse injuries. Some of the most common overuse injuries in running are plantar fasciitis, Achilles tendonitis, IT band syndrome and runner’s knee. If you don’t know your foot strike, I recommend heading over to your local running store. Depending on the store, they should be able to size you up and guide you into the right style shoe. The right shoe will have the stability to support your particular stride. Remember—wearing the wrong shoe has the potential to cause plantar fasciitis, but the right shoe has the potential to stop it. So first things first, make sure your shoe stabilizes your foot strike. Most people don’t realize it, but your foot arch is a natural shock absorber. Yes, it actually cushions the impact of your feet when striking the ground. That’s why buying a shoe with arch support is essential for those with plantar fasciitis. Arch support does not just provide relief from heel pain, but it can prevent it from occurring altogether. So when dealing with plantar fasciitis, make sure your shoe has arch support to assist. When you’re dealing with plantar fasciitis, a shoe with extra cushion will help relieve foot pain. The extra cushion alone will not help with the CAUSE of the injury, but it’s an important feature when combined with the other key components. Put simply, the cushion will disperse the force when striking the ground to help RELIEVE your pain. There are a handful of companies that invest a whole lot of money in product development. So do yourself a favor a buy a shoe from a reputable one. Below you will find a list of 10 shoes all from the best shoe manufacturers in the industry. 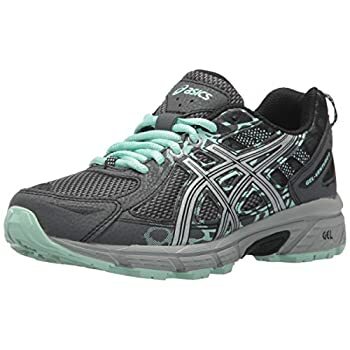 They provide shoes that help with plantar fasciitis and have the customers to prove it. Lastly, take a look at customer reviews. See who has bought shoes for their plantar fasciitis and how a particular shoe helped eliminate it. Let’s keep it really simple: if a shoe is designed for your foot strike and multiple users say it cured their plantar fasciitis, then you have an excellent chance it will do the same for you. But let’s say you have super high arches and buy a shoe for overpronation instead of supination. In this instance, no matter how many users say it helped, it will most likely only cause you problems. So if buy a shoe made for your foot strike and check its user reviews, then you have significantly increased the chance of finding the solution to your problem. Hands down the best sight for user reviews is Amazon. 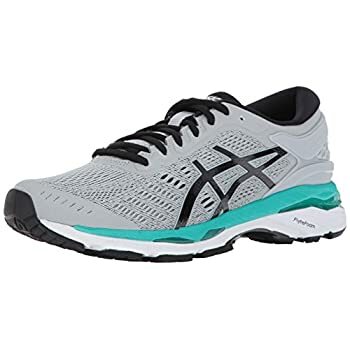 If you tend to overpronate and are dealing with a severe case of plantar fasciitis, then the ASICS Gel-Kayano may be the shoe for you. Not only is it one of the top selling shoes in the world, but hospitals even recommend this shoe to their patients dealing with foot pain. The rearfoot Gel Technology Cushioning System provides the level of shock absorption needed to keep your heel cushioned and safe. Users have reported not to love the cheap shoe inserts, but rave how they can be removed and replaced with orthopedics when necessary. Its users love this shoes for its structured heel support. Gel cushion at heel protects from unbalanced force caused by heel striking. It’s made by one of the best running shoe companies in the world, so you know you are buying quality. The guidance system helps with overpronation thus preventing body misalignment related injuries. Multiple color options will match your different running outfits. Some customers considered their inserts to be cheap. Flat feet typically will cause a runner to overpronate. Overpronation can lead to injury without the proper support. One type of injury that’s possible is plantar fasciitis. So by wearing a shoe that supports overpronation, you can potentially prevent and eliminate the pain. That’s what the Brooks Addiction will do. It will provide support and cushioning for moderate to severe overpronators. But remember—excellent stability and cushioning comes at a cost. So although you receive an Extended Progressive Diagonal Rollbar for guidance in the gait cycle and a Heel Segmented Crash Pad for comfortable landings, this innovative technology adds on more weight. So, if you’re looking for a light and fast shoe, this one isn’t for you. But if you’re looking for a shoe that you can rely on for the long run, then give it a try. When buying your pair, remember that Brooks run smaller than other shoe brands. So, you may want to order a half size bigger. Its users love it for how it helps with heel and knee pain. Provides excellent stability for overpronators. Its extra cushion benefits long distance runs like marathons. Moisture-wicking material helps keep your feet dry which makes them feel much lighter, especially on hot summer days. Its heel cushion helps protect those who heel strike from discomfort and pain. Here’s a shoe for runners with a neutral foot strike. 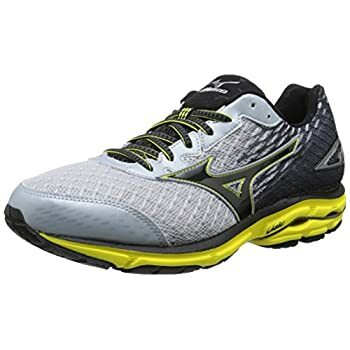 The design of Mizuno Wave Rider 19 primarily focuses on heel support. Its U4icX Technology delivers a high level of cushion which helps absorb shock under your foot. What that means for you is more time running with less pain caused by striking the ground. 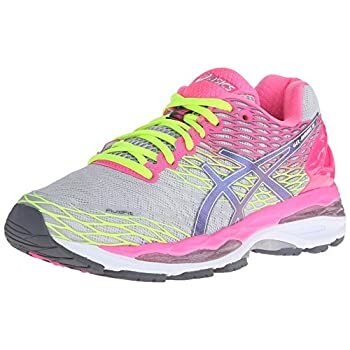 This shoe is more firm and supportive compared to the average running shoe. And if running with proper form, you can be confident to get 400 miles out of these things without a problem. Its users praise it for its colorful upper design and extra smooth fabrics. Sure, it’s not made by the most popular running company, but still, it’s a company that’s been around for over a century. Wave Technology brilliantly designed for shock absorption. Excellent heel cushion to prevent pain from heel striking. Excellent support for neutral runners. Its innovative design gives you a shoe unlike the other runner’s out there. Smaller than average toe box to narrow for some runners with wide feet. Not made by the most popular brand of running shoes. 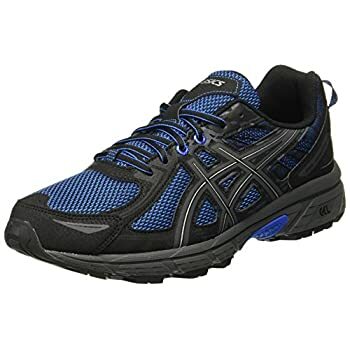 Be sure to note that the ASICS Gel Venture 6 Running shoes are best for trails. So, if you enjoy a nice run off-road or do some serious hiking, then this may be the shoe for you. The tread is rugged, and the lugs are multi-directional. This combination provides excellent traction when facing those narrow, steep, and technical dirt paths. When running on technical trails, it’s crucial to have a comfortable shoe. This holds especially true when running on top of rocks and roots. Well, with this shoe you get a snug fit, excellent protection, and extra comfort to confidently roll down those descents with assurance. Its users love that it’s not an extreme trail shoe so you can run on the road to the trails, run the trails, and then run home. Excellent sole and toe box width for toe wiggle room when trail running. Multi-directional lugs provide reliable traction when the surface gets slick. Available at a low price from a quality company. 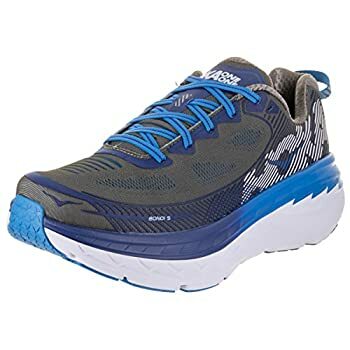 Limited to trail running so if you enjoy long road runs you will need a road running shoe as well. Users with narrow feet have reported not to like the fit. 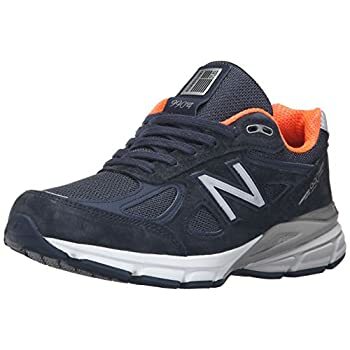 Anytime I look at a New Balance shoe I can’t help but think of the movie Crazy Stupid Love. You know, when Ryan Gosling asks to see Steve Carell’s shoes. Then when Carell hands them to Gosling, in a careless fashion Gosling throws them over the second story railing of the mall. Then he asks “What, are you in a fraternity?” The point is, these shoes are not the most stylish on the market. 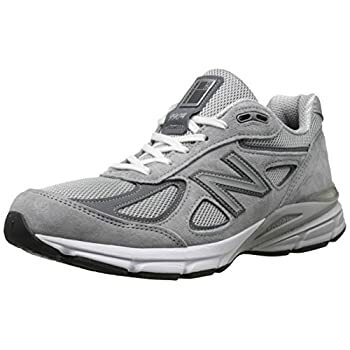 However, if you want a running shoe with excellent lateral support and comfort, then give the New Balance 990v4 a try. I can vouch for New Balance as I’ve clocked thousands of miles (yes thousands!) in another model shoe of theirs. Podiatrists also recommend them for runner’s dealing with overuse injuries like plantar fasciitis. Between the Blown Rubber Outsole, Dual-Density Collar Foam, and ENCAP PU Ring with EVA Core in the heel, you get one comfortable, supportive, and durable ride. Users with heel pain have been recommending this shoe for years. Highly durable from a reliable company, so you don’t have to worry about them falling apart. Recommended for plantar fasciitis by podiatrists worldwide. Comfortable and supportive which helps with pain management. If you’re looking for something stylish than I suggest you look somewhere else. 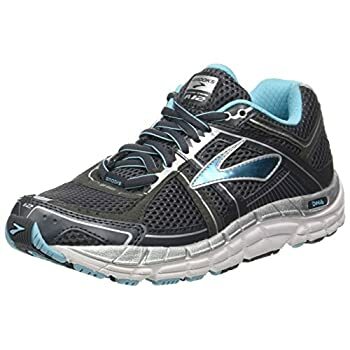 Here you have Brooks’ number one best-selling running shoe. 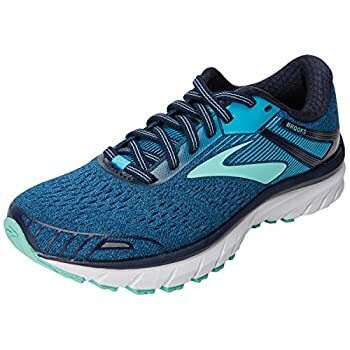 It’s called the Brooks Adrenaline GTS 18 and is best described in two words: SUPPORT and CUSHION. Remember—proper body alignment is critical in the prevention of injury. Well, this shoe comes with a reliable Progressive Diagonal Rollbar to comfortably neutralize your overpronating ankle. 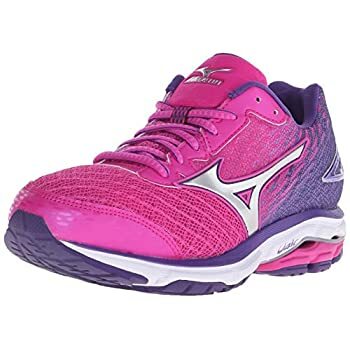 Not to mention it provides an enhanced soft and smooth ride due to its soft cushioning, seamless heel-to-toe transitions, and increased flexibility. What this means for you is running long distances like marathons without thinking or noticing what’s on your feet. Its users love this shoe because you can wear it to prevent foot pain without expensive inserts. Plush lining provides a secure grip so less chance of your heel slipping out. Highly breathable which reduces sweat accumulation. Progressive Diagonal Rollbar helps with overpronation. Excellent support and cushion for long runs like the marathon distance. Support and cushion shoes mean extra weight. Hoka One One has become one of the top shoe companies in the trail and ultra-running world. Because of their thick soles, trail runners have found their shoes to provide the comfort they’ve been looking for. With the extra cushion, instead of feeling like you are running on rocks, it feels like you are running on clouds. Or so users have claimed. Although The Hoka One One Bondi 5 is a neutral shoe mostly used on roads, it still comes with enough grip for easy trails. This makes it more convenient to begin running on trails which most ultramarathons are found on. The shoe provides exceptional comfort and is ideal for clocking some serious long-distance mileage. 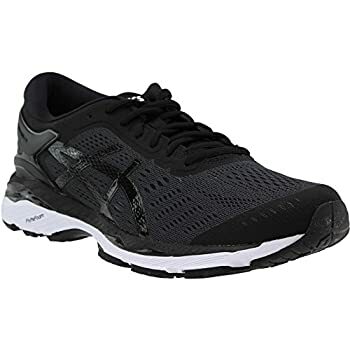 Not only do they provide a smooth, cushioned, and balanced stride, but their Open Engineered Mesh construction offers enhanced breathability which makes your feet feel lighter on those hot summer days. Its users love the shoe for its unique style as well as the extra room in the toe box. Thick soles but remains lightweight. Breathable mesh provides extra comfort for those extra-long runs. Superior cushioning is great for a long day on the pavement or time spent off-road. Durable outsole so you can be confident you are getting your money’s worth. It’s the complete opposite of a minimalist shoe. 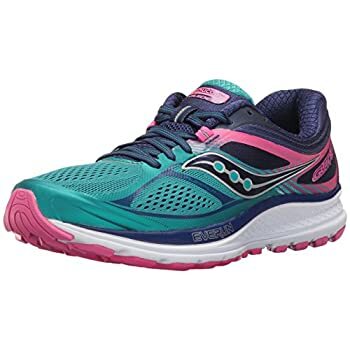 The Saucony Guide 10 is best described as a stability shoe without all the extra bulk. Yes, you get extra support, especially in the arch. However, it’s also made with a strong and lightweight material which is melded into the upper section of the shoe. This material allows the shoe to have fewer layers which provide a light and flexible feel. So you get the support and stability but it still remains lightweight and breathable. This shoe is also very comfortable with lots of cushioning. Its users say they do not wear out quickly and are worth every penny. 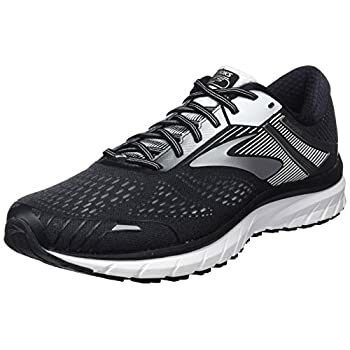 Its cushioning design provides a more comfortable run over long distance. Multiple color options with a stylish design. 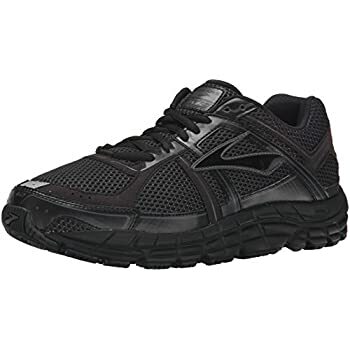 Lightweight for a stability shoe which provides a supported and fast ride. Less material creates a more flexible shoe which prevents irritations when running long distances. 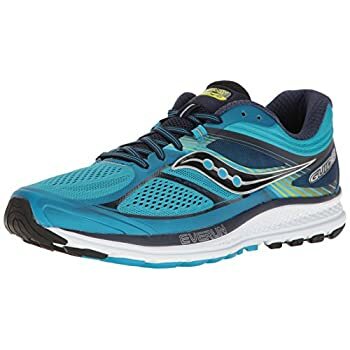 Saucony isn’t the most popular brand for long-distance running. 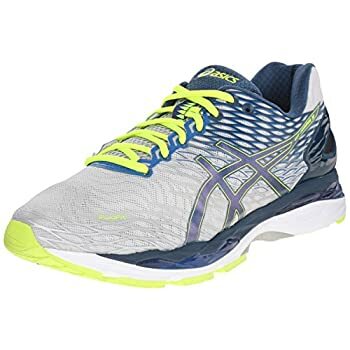 If you are a neutral runner who has a problem with heel striking, then the ASICS Gel Nimbus 18 will be a top choice for you. Within the shoe is a Heel Clutching System Technology. What this does is provide extra support for your heel as well as an improved heel fitting experience. Certainly a beneficial feature for those suffering from plantar fasciitis. There’s also a rearfoot GEL Cushioning System which absorbs the shock caused from striking the ground. What’s this all mean? It means you are protected if you heel strike. But REMEMBER— this shoe is designed for a NEUTRAL foot strike. This shoe is not the cure-all for every type of stride, so be sure to do your research. Its users praise this shoe for the relief they feel from common overuse pain in the knee, hip, and feet. Excellent heel support providing relief from heel striking. The breathable upper section makes you feel lighter on your feet. Durable midsole prevents the shoe from falling apart after excessive mileage. A performance shoe that’s stylish. On the heavier side for those looking for speed. Altra has become a powerhouse in the trail running scene. They are popping up around every corner and there’s plenty of runner’s clocking a whole lot of mileage who will vouch for them. As an avid runner, I’ve heard many reviews on the company. 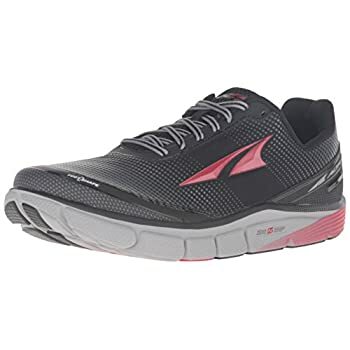 But the most positive reviews were from the Altra Torin 2.5 running shoe. And as it seems, this is the go-to shoe for runners with wide feet. One reason is that the foot-shaped toe box is designed to allow your toes to spread outwards in a natural motion. What this does is provide more stability and speed without causing excess foot movement. A stable and fast secure foot becomes especially important when hitting steep inclines and descents. One of the most unique features of this shoe is its Footpod Outsole Technology. Basically, this feature maps the tendons and bones of your feet which provides a better flex. As you can imagine, your feet will appreciate this freedom after spending miles and miles running. Yes, the features of the shoe are great but take caution when ordering. 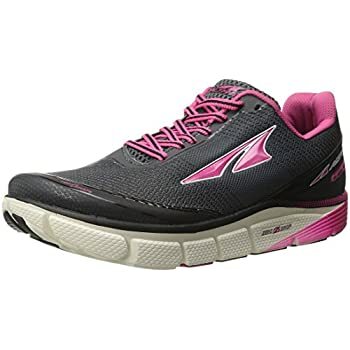 Users say there is a size difference between this shoe and other Altra models. So if you’ve bought other Altra shoes in the past, you may want to buy ½ of a size larger than normal. Its users praise this shoe for being a superior option for their wide feet. Comfortable room for wide feet but not too wide to prevent slippage. Extra cushion helps with the tough terrain of the trail. Useable on the road so running to the trail is not an issue. A zero drop provides an excellent minimalist shoe. A whole lot of room to wiggle your toes. Some runners have reported poor breathability. So as you can see, there are many different model shoes that can help with plantar fasciitis. Although you can never be sure EXACTLY what the root cause is, you can be sure that finding the RIGHT shoe will only help. It can help relieve the pain, OR it can be the actual cause of the pain itself. So by switching to the RIGHT shoe you are on the way to solving your problem. You can then move forward in your running with the confidence to keep running faster and further without the thought of injury creeping in the back of your mind. REMEMBER: The pain from GAIN is different from the pain from STRAIN. So, find the RIGHT shoe for YOU and eliminate the pain from STRAIN for good.